You’ve found your boo, but they’re not the only loved one that gets a gift this holiday season. From your future mother-in-law, to your MOH, to your flower girl and beyond, find the perfect gift for every important person in your life. 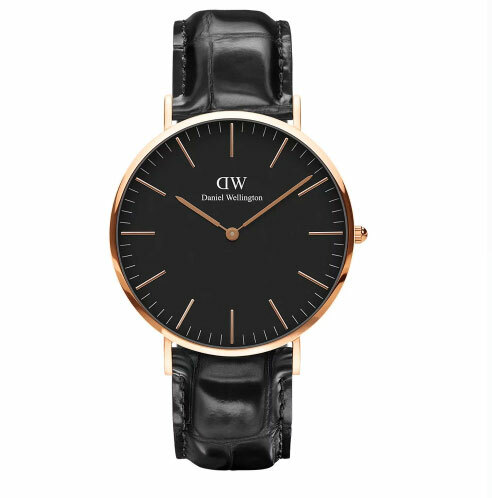 This Daniel Wellington expertly crafted timepiece is the perfect gift for your fiancé. Make sure he’s never late, and always arriving in style with this classic accessory. Whether you’re headed somewhere tropical for your honeymoon, or you just want to give him the gift of something sweet and hot, this limited-edition rum bottle is sure to win some major points. Supple leather and a masculine olive green hue give this dopp kit that little something extra. Give this to your fiancé to get him looking forward to the honeymoon! Give your girl the gift of bubbly, promising to pop the bottle on your big day. Bonus: This limited-edition paint tube packaging will up your décor game. Unwind from the stress of wedding planning with an at-home massage courtesy of Zeel. Offering an Android and iPhone app, the company allows users to order massages straight to their door, with same-day appointments! Trust us, she’ll thank you. Something blue never looked so sparkly. Wish her a happy holiday by crossing one of her wedding must-haves off of her long to-do list with these Swarovski stunners. Elegant, simple, and understated, these earrings are sure to bring a smile to mom’s face. They also make the perfect pair with just about anything she could wear to your wedding! With scents of benzoin, lavender essence, and vanilla, this will help mom keep calm during the craziness of wedding planning! Plus, the packaging is beautiful, adding a decorative element to any room. Gift dad with a nice bottle of Hennessy V.S.O.P to enjoy neat or on the rocks by a crackling fire this holiday season. Have your dad looking fresh and introduce him to the joys of self-care with this men’s grooming kit. With flavors like mint, cranberry, and original lip balm #1, these lip balms are packaged separately, so you can gift one to each of your ‘maids, or give the gift of all three. And, as a bonus, 100 percent of profits from these sales go towards Feeding America. Who wouldn’t want a new mini-beauty product every day? Gift your fav lady the 24-piece QVC calendar with everything from Kate Somerville exfoliant to L’Occitane almond shower oil. Gift your number one girl some glitz with this fun sparkly number. A coated stainless steel monogrammed flask is the perfect gift for your go-to guy. Up your best guy’s bridal style, and everyday style, with a fashion-forward pop of color pocket square. Just because you’re tying the knot doesn’t mean your maid of honor isn’t your friend forever. Show her how much you care with this eternity knot cuff. Double your holiday gift with a bridesmaid gift, with this fun getting ready robe. Hang this from the tree or add to a stocking, this vivacious lip gloss is the perfect addition to your squad’s beauty repertoire. Your bros will thank you for this monthly subscription of fun socks, sure to up their fashion game. Give your groomsmen multiple gifts in one with a fun gift box, which includes a brass keyring from Craig Hill, a pair of luxurious socks, and a drool-worthy whiskey-infused dark chocolate bar. Keep your dad’s beer cool while he’s watching his favorite game, or spending some quality time with you before the big day. Just freeze these sticks for an hour, then dad can pop them into his favorite bottle. This fun advent calendar is filled with a yummy assortment of full sized Belgian chocolate pralines and cute holiday figurines filled with a soft praliné, 25 pieces in all. For the guy that loves to grill, this custom set is a go-to, sure to win you some major future daughter-in-law points. Go beyond simple soap and offer up some scintillating scents this holiday season in the form of artfully crafted bar soaps. For the wine-o in your life, this gift is a no-brainer. Offering notes of raspberry, pomegranate, baking spice, and hints of vanilla, this drink is bold and perfect for fireside sipping. Nothing brings a smile to a kid's face like a squishy toy. Bonus: this is guaranteed to keep them busy during the ceremony! Add some sweetness to bathtime with this set of four cute bath soaps, sure to bring a smile to your favorite kiddo's face! The little one in your life will love these stamps! Whether a solo-activity or a great bonding experience pre-big day, stamps are a great option and opportunity to educate.